Buy Energizer 12v battery in bulk. Medic Batteries carries the Energizer A23 12 volt battery in economical bulk packaging. Medic Batteries offers low prices on its 12 volt battery supply and these batteries ship free. 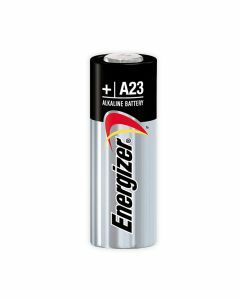 A miniature alkaline 12 volt battery, the Energizer A23 is used to power remote controls, car starters, garage door openers and other electronic equipment. Medic Batteries properly stores each A23 12v battery in a cool, dry environment so you get the highest quality 12 volt battery. Choose a supplier you can count on. Trust Medic Batteries for your 12v battery needs.